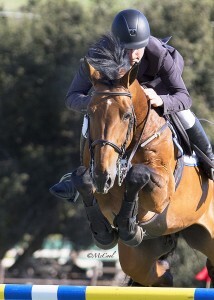 Horsetrader.com News » Article » Blenheim is back! Jim Ifko and Un Diamant des Forets, owned by Eventyre Farms, topped the field in the $25,000 Markel Insurance 1.45m Jumper Classic on March 25. SAN JUAN CAPISTRANO — With a terrific line-up ahead, Blenheim EquiSports launched its 2018 campaign with the five-day SPring Classic I show at Rancho Mission Viejo Riding Park March 21-25. In the featured event, Jim Ifko and Un Diamant des Forets, owned by Eventyre Farms, topped the field in the $25,000 Markel Insurance 1.45m Jumper Classic. An enthusiastic crowd cheered on the competitors while enjoying BBQ sponsored by Bad to the Bone. Completing the jump-off course fault-free in an impressive time of 38.514 seconds, he edged out the only other double-clear ride, Lane Clarke and McLord’s T.K.O, owned by Mickey Hayden, by nearly 3.5 seconds. Course designer Catsy Cruz of Mexico built the 1.45m track on Blenheim’s Derby Field, which included a challenging triple combination, 6a,b,c, and later a double combination, 9a,b, that caused most of the faults on course. Eleven qualifiers remain in the Markel Insurance 1.45m Jumper Classic Series. This year’s Blenheim EquiSports Spring Series features the new FEI CSI 3* schedule, including three tours / Bronze, Silver, and Gold / that will culminate with the $80,000 1.50m Gold Tour Grand Prix. In addition, the Blenheim Spring Classic II will host Zone 10 North American Junior and Young Rider Trials. March 25, 2018 * Rancho Mission Viejo Riding Park, San Juan Capo, Calif.